Please Note - UK Mainland Only. Single Delivery Charge on all Boiler Spares. Next Working Day Delivery available on orders placed before 3pm. Buying a IDEAL 173197 DIVERTOR VALVE BODY from PlumbNation is fast and reliable with a number of delivery options available to suit your needs when you are purchasing a spare part for your heating appliance. Ideal spares are manufacturer quality spare parts that can save you valuable time and money extending the life of your boiler. 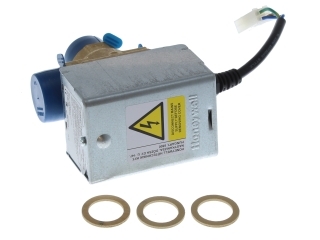 PlumbNation stock a comprehensive range of boiler spare parts from Ideal spares. With a dedicated sales and customer service team based in the United Kingdom, we are happy to help with any of your technical or sales enquiries. Please note - PCBs can only be returned if they are unopened and unused. For more information, please read our full Terms and Conditions. Our reviews PlumbNation is rated 8.4 out of 10 based on 19507 ratings.